Poor Time Management Skills Arise Again! Dudes, we’re closing on the house in two days. Two days! I am all kinds of excited. We had a formal walkthrough last night and we have another one just before closing on Friday. We’ll be moving piecemeal to start off. Which is a good thing, because we’ve been struggling to begin packing. Monkey and me, connoisseurs of procrastination. Monkey’s sis and her family are coming in to visit and help move us this weekend. It’ll be fun! It’ll be nuts! It’ll be great! I’ve been dabbling in all sorts of things in the last few weeks. Met up with some great gals here in Columbia to form our own Craft Mafia! Making fun things for the sake of making (and not selling). Becoming completely obsessed with all things seashell. Like this (I may try making my own with a cheapie Ikea mirror shortly). 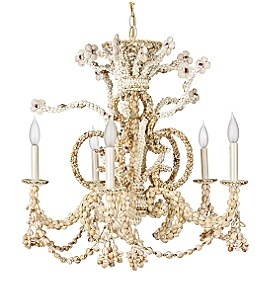 And this, which I can’t remember where online I found it, but remembering it was some kind of crazy pricepoint like $600 (I’ve become obsessed with finding cheap chandeliers that are not hardwired that I can encrust with seashells). Kim, who is an artiste supreme and a fantastic blogworld person, has extraordinary seashell creations already under her belt. I’ve got a load of fab snail mail to share pics of, but I still need to edit/resize them, so they’re coming later. So much to get my hands into. So little time. It has been an extraordinarily long time since I’ve participated in Illustration Friday, but this week’s topic is one near and dear to my heart: Tea! I only really fully appreciated tea after having been served a wondrous, warm cup after a long and dreary day of rain during my first visit to the UK several years ago. English rain can drench and chill you to the bone…It was cozy and warm in the tea shop, and just right for a spot of tea alongside scones with clotted cream. So when I think of tea now, I often think of the warm and cozy feelings of that quaint roadside teashop that offered me a toasty reprieve from the soggy countryside.